Set in the Swiss Alps in 1995, Switzerland pits a self-exiled American novelist, Patricia Highsmith (a novelist who in real life died in February 1995, aged 74, in Switzerland, where she had lived since 1982), against her New York publisher in the form of a young representative, Edward Ridgeway. Ridgeway has travelled to Highsmith’s remote mountain getaway, his path greased by promises of items that Highsmith wants, in order to obtain her signature on a contract for one more book about her literary anti-hero (The Talented) Tom Ripley (whom Highsmith created in real life). And for somebody so young, he knows a surprising amount about her life and work. What follows his arrival and sizing each other up is a philosophical soul search and creative crisis in the guise of a contest of wills and wits between a woman who won’t acknowledge what drove her into reclusion, and an acolyte who won’t acknowledge his personal need to return with a signed contract. Is the play a psychological thriller? An exposé? A disrobing? Its final turn will leave you to think through the entire play’s basis. 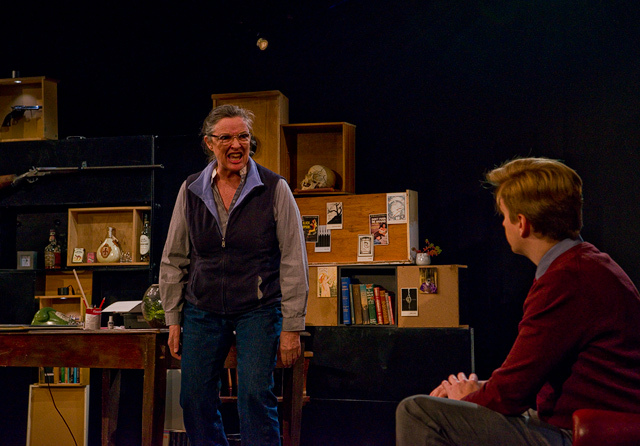 Nearly as interesting is how well two characters can carry a full-length play largely on the power of the ideas it embodies: ideas that challenge our prejudices and our conformities, and other ideas that simply express them. But Karen Vickery as Highsmith and Lachlan Ruffy as Edward Ridgeway conveyed their characters’ feelings and thoughts expertly through expression and gesture, and their timing was impeccable. Both actors’ deliveries would probably have carried equally well had they underplayed the characters a little; but Highsmith was in real life evidently vehement to a fault, and there may have been — you’ll know what I mean at the play’s finish — a hidden purpose in Ruffy’s character’s competing ardency about Highsmith’s own need for recognition. This is a thoughtful production, sounding a ring of literary truth through its choice control of language: a play that, but for its references to e-mail and modern society’s rejection of racism and gender inflexibility, could have been penned decades earlier, when playwrights were writers first and artistes a distant second. Lovers of words will enjoy its style, thinkers will enjoy its mysteries small and large, and its set is surprisingly lavish.